Swans are the largest, and generally considered the most beautiful, of the waterfowl. 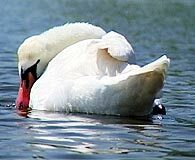 The Mute Swan is one of 7 species of swan worldwide. Adult females weigh around 9kg, with males around 11kg, although weights of up to 15kg have been recorded. 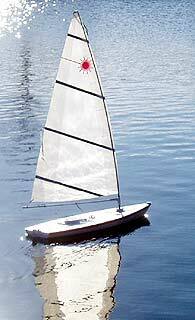 A male is known as a cob, a female is a pen, and the young are called cygnets. According to the magazine Wildlife Conservation, a swan can have 25,000 feathers. These beautiful long necked birds will breed at 3 years of age having a clutch of 3 to 8 eggs, although larger clutches have been recorded. The gestation period is 35 days from the date of the last egg. During the incubation period the male becomes very territorial and will aggressively protect his mate. He will normally use his strong wings as a weapon instead of biting. The cygnets are born with a grey downy plumage that eventually turns to white. They can fly in 3 to 4 months and generally stay with the parents until the next breeding season whey they are asked to leave. 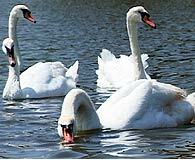 Mute Swans have been known to live for over 25 years, but most only survive to 5 or 6 years old. Many cygnets die in their first 12 months, often due to flying accidents. Mute Swans do not normally start to breed until they are at least 3 years old. Between March and May a huge nest is constructed, in which the pen lays a clutch of normally between 3 and 7 eggs (although as many as 13 have been recorded). The eggs are laid at 2 day intervals, with incubation starting with the last egg and taking 35 days. During the breeding season the male becomes very territorial and aggressive to any intruders. This behaviour has been known to extend to swans fighting to the death. 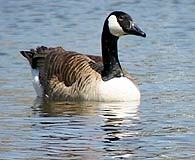 They often threaten humans who venture too close to their nests while issuing a warning call. Although they can inflict a painful blow with their wings, contrary to popular belief they do not bite. The cygnets will normally join flocks of other non breeding swans, especially during the moulting season in July - August when they moult all their feathers and for a short time become flightless. Over the next two years the immature swans may start to form a pair bond with a mate and will look for a suitable territory on which to breed. 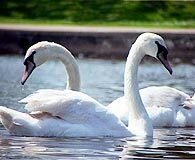 It is a popular misconception that Mute Swans pair for life and that a bird will pine to death when its partner dies. This is far from true, with some birds having as many as 4 mates in a life time, and in some cases actually 'divorcing' a mate in favour of a new one. There have even been incestuous relationships reported. However research does show that well established pairs tend to be more successful at raising their young. The lake is divided in two by a wooden bridge. The side nearest the road has been used for years as a boating lake, but in recent years this usage has declined, and now it is a haven for many swans, ducks and geese that flock here along with a large population of pigeons that are fed daily by locals and tourists alike. 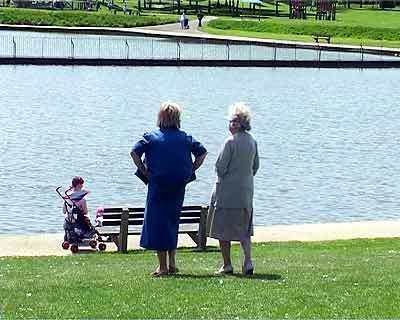 A popular place to just watch the world go by, Walpole Park is destined to be a focal point of local life in Gosport. 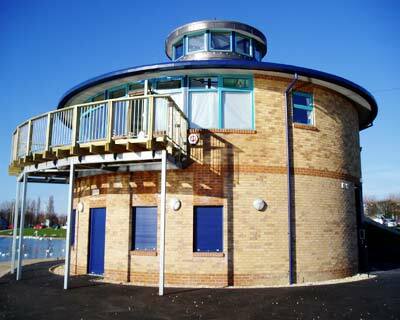 Although the Park and the Lake are now separated by the South Relief Road, they share the common thread of leisure activities space, and now has both a children's play area and a skate board run for our more energetic youngsters. 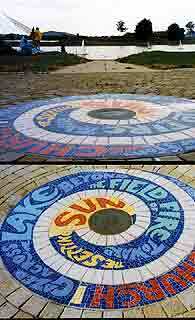 The exciting spiral design by the skateboard area has been designed by Jan O’Highway is a freelance artist, working mainly in mosaic and ceramics. Jan’s work combines glaze-painted tiles with glass and mixed media mosaic, exploiting the resonant colours and tactile qualities of clay and glass. Eye-catching and durable the glazes and lustres are suitable for large panels and interactive pieces. In 1926 the original Club House was built by the members of the Gosport Model Yacht and Boat Club and this year it is being replaced adjacent to the two ponds with a new purpose built Club House and boat store, on top of which there will be a cafe/restaurant with balcony overlooking the lakes, so it will be well settled in for 2005. A 1,200 pound horse eats about 15 lbs. of hay and nine pounds of grain everyday (seven times its own weight each year). Einstein couldn't read until the age of nine. The two lines that connect the bottom of your nose to your lip are called the philtrum.